It takes technical skill to complete cosmetic dentistry. 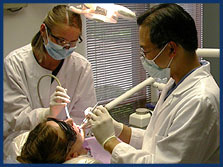 At Sea-Tac Family Dentistry Dr. Yeh and his staff will complete Seattle cosmetic dentistry procedures. Our cosmetic dentistry staff will give you veneers with high quality porcelain. Your veneers are bonded with highly advanced and proven Seattle cosmetic dentistry materials. Traditional braces give your smile a metallic look. Retain your natural smile with Clear Braces. With porcelain veneers your smile will last for over ten years. Other cosmetics dentistry options include crown lengthening, Inlays and Onlays. Visit Sea-Tac Family Dentistry for cosmetic dentistry. Have you heard of the affordable Hollywood smile makeover option? Sea-Tac Family Dentistry introduces Snap-On Smile cosmetic dentistry. Snap-On Smile is a patented high-tech dentil resin. Snap-On Smile is painless with chewing, eating and talking. Snap-On Smile cosmetic dentistry gives your teeth a strong and natural look. Use it as a temporary or permanent dental cosmetic solution. Snap-On Smile cosmetic dentistry is available for your upper or lower teeth. Dr. Yeh is a Snap-On Smile expert. He will educate you on the benefits and care of your new dental solution. Snap-On Smile fits over your own teeth. It easily hides stains, chips, gaps or missing teeth. The Snap-On Smile is up to 50% cheaper than porcelain veneers. No drilling, shots or change in your tooth structure. We can give you a new smile in two short visits. Find out why our patients are always smiling. You’ll enjoy plenty of benefits with Snap-On Smile cosmetic dentistry. Why should you try Snap-On Smile? The cost of cosmetic dentistry can be high. Porcelain veneers can cost $900-$2,500 per tooth. Concerned about the cost of cosmetic dentistry? You can get an entire Snap-On Smile set for up to 50% less. Snap-On Smile is an excellent choice for anyone who’s not a candidate for bridges or implants. No one likes invasive dental surgery. Snap-On Smile is non-invasive. Partial dentures can be uncomfortable. Snap-On Smile is comfortable and easy to care for. Here’s how it works. You pick the style and shade you’d like. Dr. Yeh takes an impression of your teeth. In three weeks you return for a final fitting. You get to wear your Snap-On Smile set and take it home. We offer a 12 month limited warranty against manufacturer’s defects. Your warranty can be extended for up to 3 years. Your Snap-On Smile can last 3-5 years with proper care. Follow Dr. Yeh’s careful instructions. Learn more at http://www.snaponsmile.com.